I want to share with you something pretty out there and a bit personal for me...my birth story. For a 1st time mama I thought other mamas would find this helpful and even others expecting or thinking of children in the future. It's officially been 6 weeks postpartum and I'm feeling much better...well like 100x better lol then the first few weeks. I hope you enjoy my birth story and please comment below if you're a mama! So I was 39 weeks on the week of September 3rd 2018. My calculated due date was September 12th. My birthday is September 10th, so I thought there was a good chance baby boy might show up on my birthday, but he had other plans lol. On September 5th, my water broke around 6:30 AM. I was woken up in my sleep by a sudden gush of water that soaked my underwear and the sheets under me! I got out of bed as fast as I could and had an "urge" to pee and more water continued to come out. Some even dripped on the carpet and bathroom floor. I immediately knew this was my was my water breaking, so I called my husband right away and told him the good news! He was at work, so I waited for him at home and called the doctor, my family and his parents in the meantime. The doctor said to come in as soon as possible since my water broke on it's own. So we grabbed our bags, I got ready, my husband changed and we got to the hospital around 8 AM. Thank goodness it was only 12 minutes away! I got checked into Triage and got undressed and put on that lovely green hospital gown that buttons in the back along with a jumbo pad and mesh underwear lol. At this point, the fluid along with blood kept coming out. So that jumbo pad came in handy! They hooked me up to monitor my contractions and baby's heartbeat. My husband then got checked in and joined me in the room. We had breakfast which his mom brought for us, which I made sure I ate and I am so happy I did! While in the Triage room, around 11 AM I got checked to see if I was dilating, and I was dilated 2 cm! So they said I was safe to stay and they weren't going to send me home! So from there, we had to wait a little for the room to get ready and then I got wheeled in a wheelchair to my Labor & Delivery room. We arrived in our Delivery room around 1 PM. Around that time, the doctors came in and offered me pitocin to help speed up my contractions. I decided to talk it over with my husband so they said they would give us some time. I ordered some more food and then decided to go with the pitocin. I got hooked up around 3 PM. From there, my contractions were still pretty tolerable so I could still walk the halls and rest in bed. At around 6 PM I got checked again and I was 4 cm dilated. Then around 8 PM is when things really started to get serious. My contractions were around a 6-7 pain level (out of 10) I did everything I thought of to help take my mind off the pain. I danced with my husband, I sat on the birth ball, and rocked in the chair. At that point, I asked the nurse to fill the hot tub. I got into the hot tub around 10:30 PM. My contractions were so strong that I was yelling from the pain. I was in the hot tub for about 30 minutes when the nurse told me I had to get out because baby's heartbeat was dropping. I barely made it out with the help from my husband and nurse. At that point, I was completely naked with the just the gown on and I didn't care lol, which I thought I would. I got into the bed and the nurse checked me and said I was fully dilated!!! It was time to push! Within 30 minutes I had gone from 4 cm to 10 cm!!! After about 40 minutes of intense pushing on my back and some side...our bundle of joy Milan Valery Moonsammy was born on September 6th 2018 at 12:20 AM weighing 6 lbs. 14 ounces at 21 inches long. I'm happy I asked for a mirror so I could see his little head and that really motivated me to keep pushing! The moment I saw him and his little eyes looked up at me, my heart melted and I fell in love all over again! It was the most amazing feeling ever! It makes me tear up replaying that moment in my head! After being in labor for 17 hours and having it all natural with no IV pain medication or epidural...it was quite the experience, but I would do it all over again! 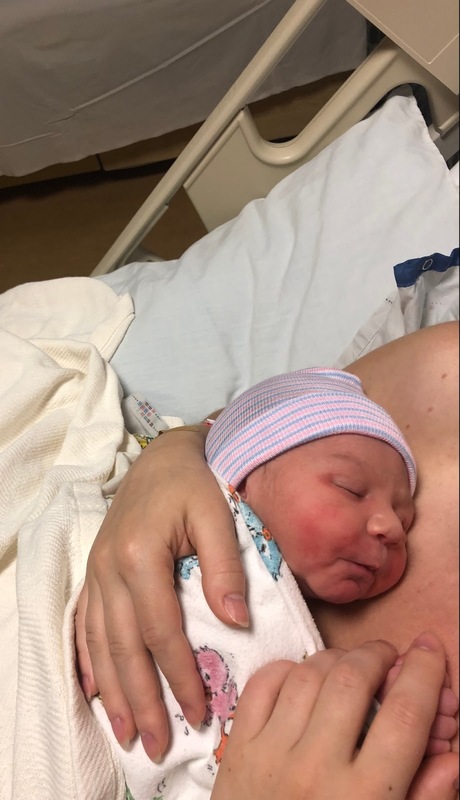 I hope you enjoyed my Birth Story! Thanks for reading!